I will admit it wasn’t easy; I didn’t want to go to the pool. I tried to find excuses not to go, and I don’t normally struggle with that. After years of working out, not going to the gym is like not cleaning my teeth – the dirty sensation looms over my head all day. When I’ve been to the gym, I feel energised, ready to take on the world. I knew this to be true. But I did not want to get back in the pool. Was Caloundra really that bad? Of course not: as above, I did not die of drowning or of embarrassment. But the stupid irrational part of my brain (the same part that panics in open water, most probably) did not care about these facts. It could not comprehend that this is just a numbers game, and that by ticking off another open water swim we were one number closer to that magic number (whatever it may be) when suddenly we wont panic anymore. It worked in the pool, and I know it will work in the ocean. My stupid irrational part of my brain did not believe me. So Christmas Eve, I reluctantly pulled myself out of bed. It was drizzling slightly outside and I wondered whether I could work this ‘issue’ into an elaborate story whereby I was unable to go to the pool because I was wet from the rain. Or something. As I pulled on my triathlon suit (I have given up on the see-through swimming costume and really must buy a new one) I considered the somewhat plausible notion that I shouldn’t wear out or destroy my tri suit more than was necessary before the first triathlon. Surely wearing it too often to the chlorine-urine-sweat-filled pool would eventually make it see-through as well, I told myself. Somewhere inside me the triathlon machine I have been building perked up, and volunteered the information that we could swim naked. So, the triathlon suit it was. I opened up Instagram in a final attempt to find something more interesting that I desperately needed to do at 6am on Christmas Eve. I was able to waste about 3 minutes and then there was no denying that it was time to get in the car and go to the pool. In other words, I lied to myself. The car park was almost empty, so as I walked into the pool area I was surprised to see there were only two lanes free. And my stupid irrational brain said ‘dammit, our favourite lane is taken’ because when you are feeling vulnerable silly things take on a heightened state of importance. A few swimmers had stopped for a breather at the wall; some were chatting to each other. I felt like they were all watching me – the show-off in the triathlon suit that’s a bit too small for her, what an idiot. As soon as I jumped in I could feel that I was tense and not breathing properly. I bobbed my head in and out, practicing breathing, feeling stupid for having to practice breathing. If it’s not clear – I was beating myself up pretty badly. My broken finger is healing quite well, although it is still a funny black colour. But as soon as I started swimming, I felt it bend backwards slightly and it hurt. I lost the momentum in my stroke, which threw off my breathing and I was spluttering after only about 3 metres. So that was how it was going to go down. It was a spluttery, uncomfortably tense swim. I lasted 45 minutes, which felt like 45 hours, but didn’t do any great lengths – the longest non-stop stint I managed was 200 metres. Other than that, it was a slow and uncoordinated 100 metres at a time, with a breather before setting off again. I don’t know what I did in total. On reflection, I have no one to blame but myself. I orchestrated the whole thing in my head, which was stupid because I already know that how I speak to myself about swimming is important and makes a difference. I had made a bit of effort to tell myself what I needed to hear, but I am going to have to practice holding onto the lies the affirmations I try to tell myself on the drive to the pool – because I do know I can ‘fake it til I make it’ with most things, so swimming should not be any different. On the days that I do well – and there have been lots of good swimming sessions – I need to stop and think about it, soak in my brilliance and bathe in the pleasure of spying the Unicorn that is Improvement. I have spent a lot more time and energy mulling over the bad sessions than the good, and that needs to change. One positive from the session is I’m looking forward to my next swim tomorrow and I have a plan – Think Good Things. Remember! Repeat! 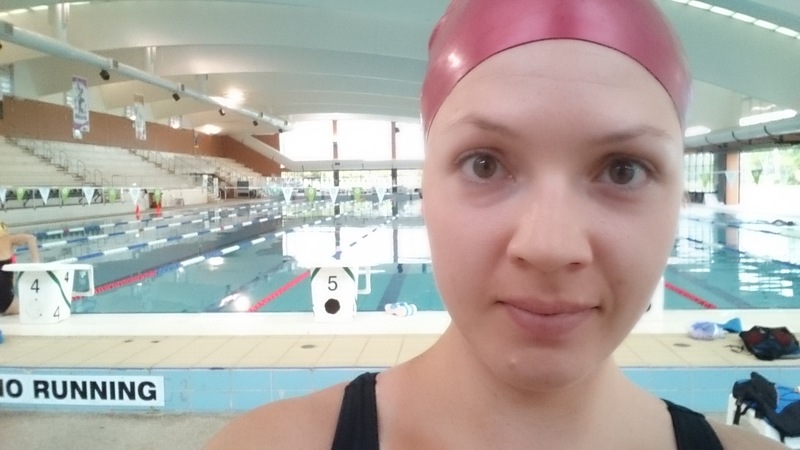 I am starting to love swimming; my improvements in this part of triathlon training have literally been AMAZING and I have plenty of time to get even more comfortable in the pool before my races. And, once I’m super comfortable in the pool, I’ll be a lot more comfortable in the ocean. This entry was posted in Show Me Swim and tagged failure, freestyle, logic, newbie, quitting, strategy, swimming, training, triathlon, Triathlon Gods, unicorn. Bookmark the permalink. That’s it; laughing in the face of physical pain and exhaustion.